Somewhere between 2:30 and 3:30 this morning, I was in that kind-of-awake state that wasn’t full awareness but still enough that the missed sleep caught up with me later in the day. There was an idea. Really just a snapshot series of images and a few sentences of story, and I think I fought falling back to sleep entirely because I wanted to make sure I had them right, and I wanted to remember them later, but at the same time, getting out of bed to write them down would have disrupted the chain of thought. And I could see this character and the setting, and the weather and his casual, knowing grip of a sickle during a confrontation outside a stable. This morning, I got up and wrote it down as part of the backstory for the Dungeons & Dragons character I’m creating, and doing that – just sitting at the keyboard and making something up – was something I felt like I hadn’t truly done in a long time, and it felt awfully damn good. I sent those briefly-fleshed-out notes and my halfling rogue’s stat sheet over to the guy who’s going to be overseeing this adventure to see if I’d worked the numbers right and to get feedback on the way my character is shaping up. I also confessed to being a little bit intimidated by the rules and calculations. See, over the weekend, while I was finally finishing up repainting the office – which I started almost a year ago – I started listening to the Penny Arcade / PvP / Wil Wheaton D&D podcasts as a kind of psyche-up and to get a feel for how the game flows (I started with Series Three, but the first two are archived here). And the podcasts have been absolutely stellar in the way of getting me excited about the game, but man – they figure and refigure their bonuses and penalties and actions and options with a blazing speed that leaves me saving vs. HeadSpinVomit. I mean, I don’t mind doing a little math in gameplay for strategy’s sake, but what have I gotten myself – and my lovely wife – into? Kato responded with an Email of +10 Reassurance, some important notes about my character stats (several of which I had, in fact, not quite nailed, missing a crucial adjustment), and a few other pointers. He also said he liked the little bit of backstory – That vivid scene, incidentally? My character’s not even in it: It’s his great-grandfather. – which felt like the first fiction I’d written in too long. Absolutely worth an hour’s lost sleep in the dead of night. I haven’t created a Dungeons & Dragons character since sixth, maybe seventh grade. And I sold my only D&D book – the Fiend Folio – more than a decade ago. But last night, as the Cavaliers totally tanked against the Celtics, I muted the TV and hunched over our family room coffee table with a couple pencils, fresh character sheets, and my brand-new Player’s Handbook (thanks, guys who bought Collect All 21 on Saturday!). My urge to try the game again has been growing over the past year, and my recent trip to PAX East and subsequent reading of Fantasy Freaks and Gaming Geeks fanned the flames. So when my friend Kato extended the invitation to take part in a small test-the-waters sort of adventure, I got a little bit psyched. And then – oh, yes, then the all-but-unforeseeable occurred: Jenn expressed an interest in playing, too. Now, she’s a former theatre buff, so role-playing seems to me like something she always would have kind of been open to, but she was always just a little wary when I brought up the notion of hanging out with our friends and rolling d20s for a night. In we dove: It was strange not using the dice-rolling method (Kato advised us that as beginners, we’re probably better served with a less random approach) to determine our ability scores, but again – penciling numbers in those spaces labeled STR, CON, DEX, INT, WIS and CHA … well, it just poked into some really, really super-dormant corners of my head in a completely enjoyable way. We clumsily worked our way through the process of figuring in the bonuses for our races and classes (an Elven Cleric for Jenn, and me a Halfling Rogue) though with only one copy of the book, there was a lot of flipping back and forth and bookmarking with stickynotes. We wrote down our Hit Points and carefully logged our Defense Modifiers, and before we could finish, it was time to go pick up our daughter from her weekend trip, so we closed up shop for the night. Monday, then, I picked up where I’d left off, and I think I’m mostly finished. My character still lacks a name, though he’s got a sketched-out backstory in my head, and the plan is for us to send our creations to Kato to see if we’ve managed to come up with adventurers suitable for the quest ahead. Can you hear the dice? 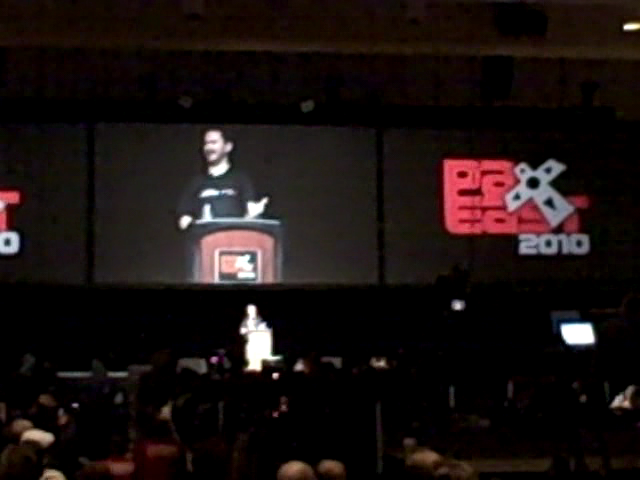 So, while my first day at PAX East had centered on the Bringing Up the Next Generation of Geeks panel and catching Wil Wheaton’s keynote – which I covered in this post for GeekDad – Saturday morning’s sunrise illuminated Me On A Quest. Because over the past year, my daughter Kelsey has become a major Wil Wheaton fan. It started just before Penguicon 7.0 last May, when we watched video online of him playing Rock Band at a convention, and she has since enjoyed both The Happiest Days of Our Lives and Just A Geek. She was excited to see him show up on The Big Bang Theory and can’t wait for Evil Wil’s return to the show next month. 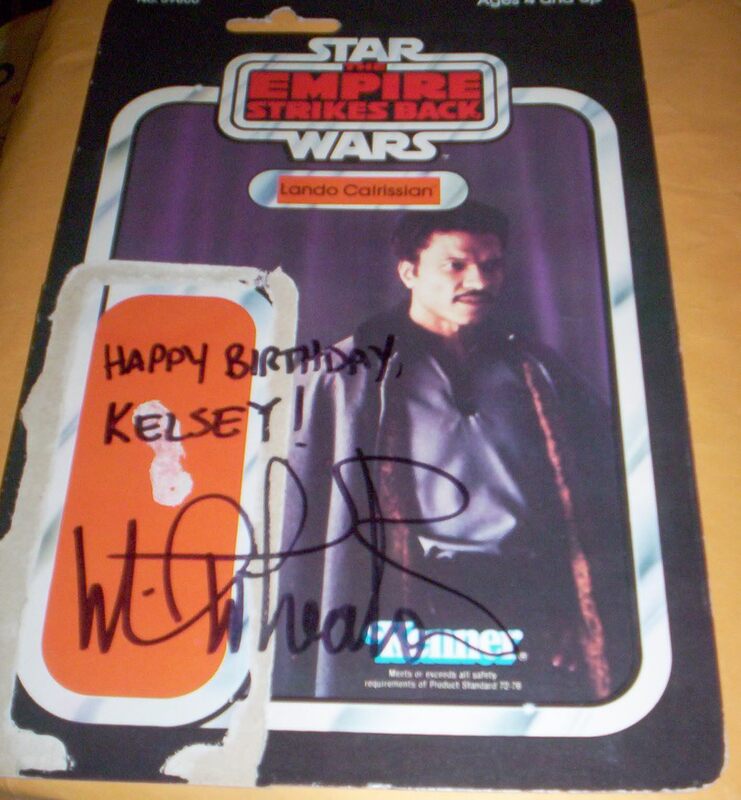 When Kelsey heard Wil was going to be at PAX, she asked if I could get him to sign something cool, and we came up with what we thought he might think was a pretty funny idea: a vintage Kenner Lando Calrissian action figure cardback. A friend in the Rebelscum forums hooked me up with one in a flash, and the task was set. Adding to the pressure on me was the fact that Kelsey had just turned 13 on Friday, and I was really aiming to bring home a one-of-a-kind present from my trip to Boston and garner some bankable Dad Points with my newly-minted teenager. In the end, I opted – hoping that Bill Amend would understand a Geek Dad’s dilemma – to aim for an early spot in Wil’s line, and I wound up among the first dozen people or so, along with my friends Paul & Wendy, who showed up not long after I did. Wil arrived shortly after 11 a.m. – by which point the line had in fact become pretty sizable – and the reality that the Quest’s End was in sight settled over my shoulders. Paul & Wendy were in front of me, and they have their own superfantasticool Meeting Wil story which they deserve to share themselves if they so choose, and then I was stepping up to the table. Wil was incredibly kind and enthusiastic and friendly as I thanked him first for inspiring my daughter and me to attend Penguicon last year, and then briefly related Kelsey’s enthusiasm for “Blue Light Special,” handing him the Lando card and explaining that we thought it would be funny and then – “Ohmygod!” he interjected, just grinning and looking at this card and saying how cool it was and he hadn’t seen one in years. Suddenly I felt a little bad because I wished I’d brought an extra one for him to keep, even as he neatly printed “Happy Birthday Kelsey!” and then added his signature, reminding me that I should let it dry for a few minutes to keep the ink from smearing on the glossy card. The whole thing took maybe two minutes, tops, but it was awfully neat. 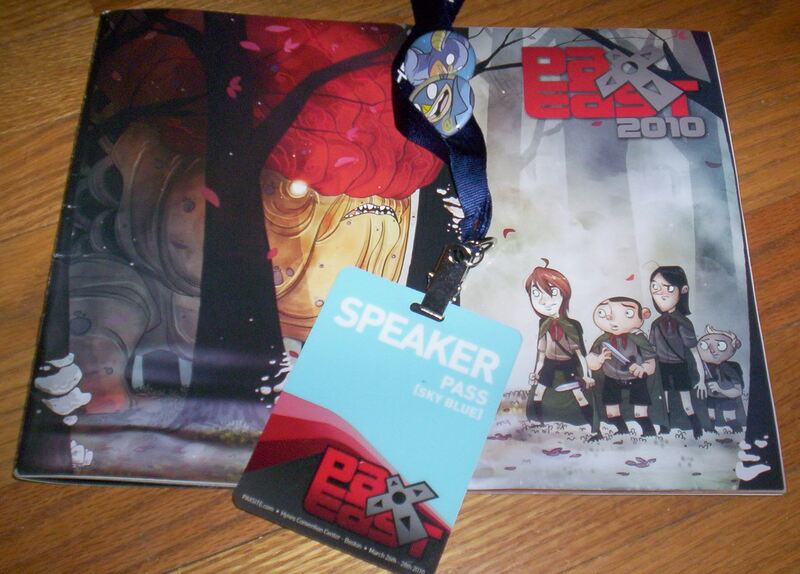 The 10 day countdown to PAX East is ON! I’ve already given the the two-color highlight marker treatment to my printout grid of the schedule, and in the interest of showing some restraint, I managed to keep my “MUST SEE” highlights to three. My “MAYBE” list, though? Yeah, that’s up to 20 events and panels, and there’s clearly no way I’m making it to all those, especially since there’s a fair bit of overlap. How young is too young for The Hobbit? What should my kids’ first LEGO set be? How can I control my disgust if my child tells me he likes Jar Jar and the Ewoks? When should I buy my kids their first non-six-sided dice? These questions and many more will be discussed by writers for Wired.com’s GeekDad blog and other geek parents. Come share your stories and advice for how to make sure our kids grow up to be geeks like us! Don’t have kids? Show up and find out what may be in store for you if you ever do! In fact, I’d bet that panel alone and the chance to sit down with fellow GeekDad writers Dave Banks, Natania Barron, Matt Blum, Doug Cornelius, Michael Harrison and Corrina Lawson will make this whole road trip worthwhile by itself. And yet there is more, from what I figure will be the high-profile draws like Wil Wheaton’s keynote, concerts by MC Frontalot, Paul & Storm and Jonathan Coulton and the Penny Arcade creator panels to the more narrowly-focused offerings like this movie GET LAMP (I was a huge Infocom text adventure fan back in the Commodore 64 days) and a look back at other arcade and computer games of my youth. As if all that wasn’t enough, this is my first visit to see my old friend Aaron on his turf since he moved to Rhode Island, and he’s a frood who really knows where his towel is. Support Independent Publishing This Weekend! There are five good reasons to shop Lulu.com this weekend: From today through May 25, grab the discount code off the front page for five bucks off an order of $25 or more (before shipping costs – I already checked for you!). I mean, you really can’t lose here. There’s a lot of good stuff on Lulu. Wil Wheaton has distributed his last two works through the site – and as it happens, he just did an intervew about it with The Washington Times; Julian Dibbell’s “My Tiny Life” is there, too, as is the big ol’ prank “Atlanta Nights,” which has a great backstory. Don’t be afraid! Visit Lulu! Buy stuff! And have a great weekend!